Non specific lower back pain (NSLBP) is the most prevalent cause of disability in the world. According to Burnstein et al. (2014) there is an urgent need for further research into lower back pain due to the ageing population. Research has shown that exercise is an effective treatment for lower back pain. Clinicians have tried to identify NSLBP subgroups that respond well to specific exercise treatment plans. A subgroup of NSLBP patients with movement control impairment (MCI) can be reliably diagnosed, though it is unknown what type of exercise plan is most effective. MCI is defined as a deficit in the control of movements during functional daily activities. The purpose of this study was to assess the effectiveness of a specifically tailored exercise plan to treat MCI versus a traditional general exercise plan for NSLBP. 201 patients with lower back pain were recruited, and were then screened using a number of criteria including age and comorbidities, with 48 being excluded before baseline assessment. Following baseline assessment, a further 47 patients were excluded for various reasons. The remaining 106 patients were then randomly allocated to either a general exercise (GE) group, which aimed to improve muscle strength of all relevant muscle groups in the lumbar and pelvic region, or a MCI specific exercise group which specifically addressed pain-provoking postures and control on impaired movements. The patients were allocated using block randomisation. The primary outcome measure used was the Patient Specific Functional Scale (PSFS), and the secondary outcomes were pain, as measured by the graded chronic pain scale (GCPS), and disability, which was measured using the “Disability score” provided by the GCPS and the Roland-Morris Disability Questionnaire. Measurements for all of the outcome measures were taken at baseline, post treatment, after 6 months, and after 12 months. 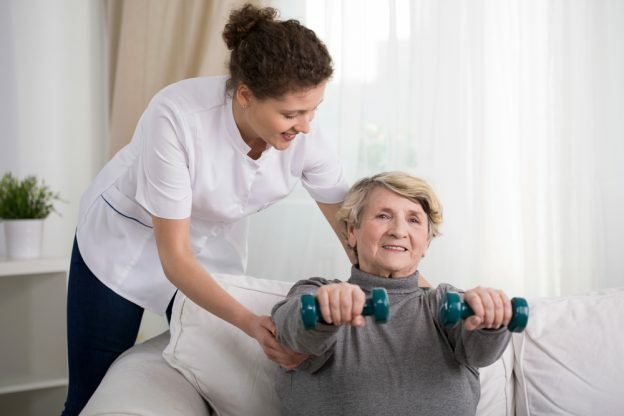 The trial found that using specifically tailored exercise plans rather than general exercise plans provided no additional benefit to NSLBP patients with movement control impairment. For the primary outcome measure, both the MCI group and the GE group improved significantly over time on both mechanical and chronic pain as measured by the PSFS. The follow up at 6 and 12 months showed that there was no statistically significant difference between the groups. The secondary outcome measures showed similar results to the primary outcomes. Both the GE and MCI groups showed significant improvements over time. The difference in pain and disability between the groups was not significant. Nearly all patients who were previously on full or partial leave from work improved their work status. One patient in the GE group remained on partial sick leave. The comparisons of both primary and secondary outcomes between the two groups are based on 95% confidence interval values. In order to assess the strengths and weaknesses of the study in a structured and clear manner, I used the CASP randomised control trial appraisal tool. This study focused on a specific patient group, NSLBP patients with MCI, and used outcome measures which had been previously shown to be reliable and valid. The sample size was reasonably large, with 106 patients being assessed, though a larger sample size would be favourable. The patients were also all selected from hospitals and practices in Switzerland. The data would be more useful for clinicians if a wider population had been used. The trial also aimed to reduce bias. This was achieved by using computer aided block randomisation and using an independent specialist to assess baseline statistics. The trial also blinded the outcome assessors and data analysts to the allocation of patients. It is not possible to blind patients or physiotherapists in a trial such as this one. To reduce the bias this may cause, patients were kept naive about the research goals. Because of this inability to blind therapists and patients, it is important to note that bias may still occur. The two groups were similar at baseline considering the size of the group. The groups were closely matched on mean age, height, weight and Oerebro musculoskeletal pain questionnaire. The only significant difference in the two groups at baseline was duration of pain, (MC-9.0 years, GE-15.7 years) which may affect outcomes. The trial provided similar numbers of treatment sessions, with patients in both groups receiving a mean of 8-9 treatments. The patients in both groups were also treated by similar physiotherapy teams with mixed ability levels. This equal treatment is made clear by the comparable levels of satisfaction reported by patients in both groups. 70% of and 80% of patients in the groups rated satisfaction as 8 out of 10 or higher. Though this trial found that there is no significant difference between these two treatment methods, the trial is still of clinical importance. The trial showed that both treatments are effective at treating NSLBP with MCI. This can be applied in practice as the results are generalizable to a wider population. It also allows for multiple treatment options to suit specific patient preferences. SANER, J., KOOL, J., SIEBEN, J. M., LUOMAJOKI, H., BASTIAENEN, C. H. G. and DE BIE, R. A., 2015. A tailored exercise program versus general exercise for a subgroup of patients with low back pain and movement control impairment: A randomised controlled trial with one-year follow-up. Manual Therapy. October, vol. 20, no. 5, pp. 672–679.